In this article, we’re going to show you how to expand your reach and get more exposure with your content marketing campaigns, and how to do it in a bigger and more organised way in 2018. It’s never been as easy to publish and syndicate content on multiple platforms and increase exposure as it is right now. Content marketing is as much of a sure-bet as you can get online for long-term traffic. People that have been publishing content for a long time already know that if you publish something that’s really good, then you’re going to get visitors. We’ve seen this from different web properties that we’ve had up and running, and videos that we’ve published over the years. 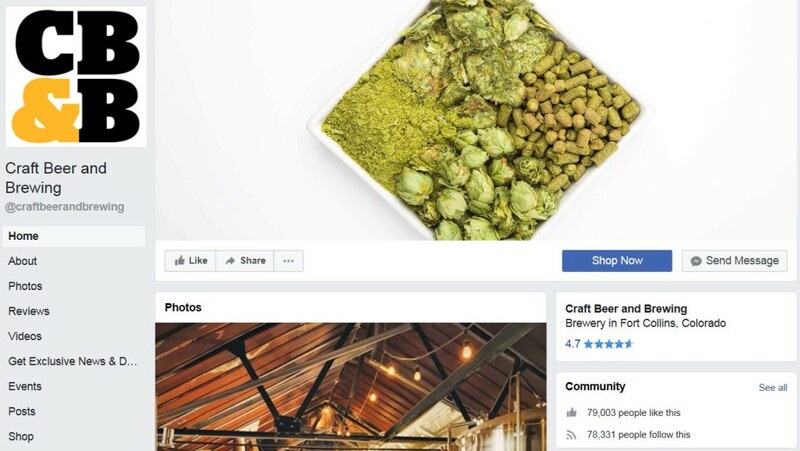 As an alternative traffic strategy, Facebook paid ads are great, but you can often get into a bit of a slug-fest and it can hit your wallet hard, a lot of people are running FB ad campaigns meanwhile NO-ONE is thinking about properly leveraging content marketing, so it’s still an untapped opportunity which you can tap into and get a good flow of traffic coming in. This is a slow-and-steady approach to traffic generation. The approach that we’re taking to our content marketing strategy is to ‘be everywhere’. In a nutshell, we publish good quality content, syndicate it across different platforms (YouTube, Facebook, Pinterest, etc), then identify what works (for a specific niche or topic) and double down on those strategies. If you’re thinking about publishing a lot of content, it’s worth noting that I’d rather have two or three really good pieces of content a month, like blog posts for example or videos in your niche, than a ton of lower quality pieces of content. A positive spin-off of providing great quality content upfront is that people will subconsciously think: “oh my god, this guy gives so much good quality content up front, imagine what I get when I buy something from him”. So if you’ve got a product to offer in addition to your blog content, it can dramatically improve sales. By releasing optimized content in an organized and strategic way, traffic will follow. 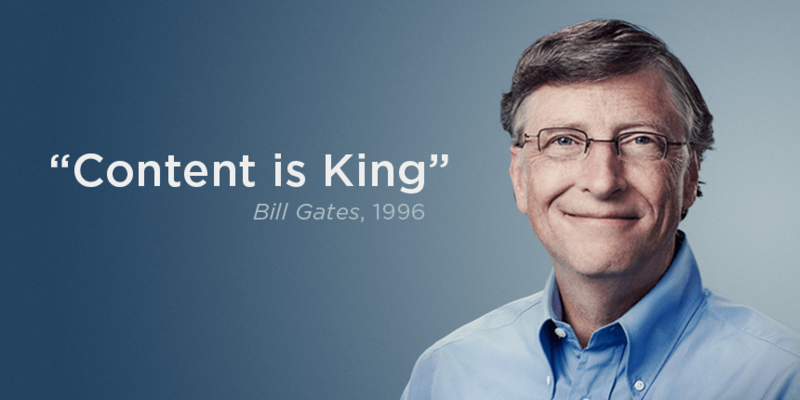 Remember content is king, it can really give you a rock solid foothold in your market for years and years to come if you develop good quality content. It doesn’t really matter what you’re selling, this can be applied to most niches in one way or another. Not only is content key for re-targeting, it’s also good for a soft sell, so if you’ve got a blog post about something in your niche then you can work in a soft sell, it may not be a monetary transaction, it may just be to get them to opt-in to get something else. 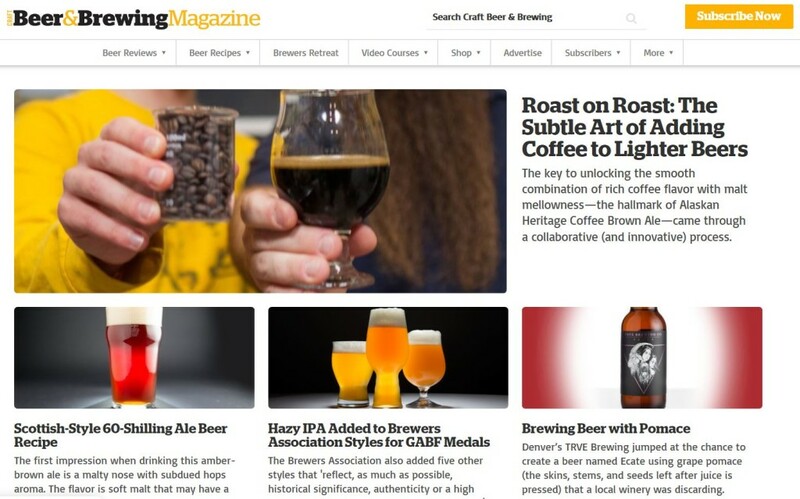 A lot of what we’re doing now is built around content that you can put on a blog. Sometimes you might have to think outside the box, but there’s normally a way you can tie this in with whatever you’re selling, in any niche. This blog post was made up of four videos, each of 5 minutes in length, about outsourcing (the topic could have been anything though). They’re always popular, as they answer questions and solve problems. This template can be applied to virtually any niche at all. This template is one of the easiest options of all, because it’s easy to outsource, can easily be transformed into an infographic (for further syndication), and can be broken down into ‘small chunks’, making it easier to prepare. Using a numbered list approach, such as “7 things that’ll help you do ___”, or “10 things you can do today to grow your business” will force you to build a skeleton of the content, then it’s just a case of filling in the gaps. This is where you take content that is already out there and summarise it in your own words, or take multiple opinions about something about a particular topic and add your own thoughts to it. Online Marketing Classroom has a free content search tool which is a GREAT way to identify popular content in your niche, you can use it to find the most popular and shared articles, videos, infographics etc., which you can then write about. 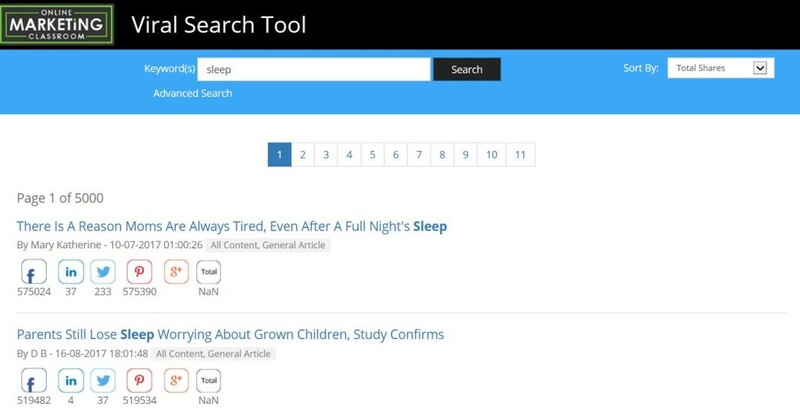 Our content search tool is a great way to get ideas to talk about in your niche. Another template we use is the “expert interview”. This is where you sit down with an expert and they interview you, or alternatively, you interview them. Can be done face-to-face, Skype, email, etc. This interview was conducted on Skype, and gave plenty of content which could be turned into a fully fledged blog post. The good thing about interviews like this are they they often have a “feel good factor”, and can give a real human element to what you’re doing. TIP: If you can get your face on video, it’ll help build up a lot of credibility as well. Whatever niche you’re in, you can identify a few different experts and combine their thoughts to build out a detailed piece of content. You’ll be amazed how lots of different experts will fall over backwards to give you a few minutes of their time, because they don’t get asked that often to participate in something like that, especially if you come to them with a credible blog or a YouTube channel, or even just enthusiasm about your niche. Why would they participate? It’s free exposure for them and it positions them as the expert if they weren’t already. Ask a question to 10 or more experts in your niche, and their answers become the content of your blog. If each person gives you 20 or 30 seconds of audio content or 100 words, then you’ve got 1000 word blog post. This will then give your blog even more credibility because you’ve been speaking to the editor of ‘X’ magazine for example. So how do you contact these experts? You can use contact forms on websites, friends of friends, if you’re in that niche maybe you’re already on their Facebook page and you can send them a message. This is a similar strategy to #2, this is where you give a checklist of things someone might worry about and list the best practices for that particular topic, for example; if you’re in the gardening niche, you may want to give a 10 part gardening checklist. Anything like this that is a list of ideas is really easy to outsource because you can just go to someone and say ‘write about this’. Map out a simple infographic; you can simply sketch something on a piece of paper or on an iPad, or create a bullet point list and give it to the designer and say ‘turn this into a nice infographic’, and this works really well. Pinterest is a great place to publish Infographics (and get more exposure), and it’s also a great resource for getting ideas for your niche. The great thing about Infographics is that they get shared. People LOVE them. They’re a great way to convey information, and when done well, are perceived as being high-value resources. In most niches there’s different “household name” products out there, you can do a review of one of them, or a comparison of two of them. 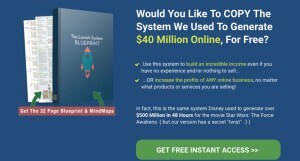 You can compare two popular tools, strategies, services, and then use this as a lead in to selling something. If you are reviewing popular brands, you’ll be able to cash in on search engine optimisation because you can set yourself up for a top Google ranking. If your review is about a product that lends itself to affiliate marketing, then you can obviously put your affiliate link in there and earn commissions. This is where something happens, and you write something about it. In the example below I wrote a blog post about the Google Panda update and what I thought it all meant. If you don’t have the expertise or don’t want to write your thoughts you can just take every day thoughts from other experts. So there you have it, 9 easy ways to approach content creation, it doesn’t have to be difficult! 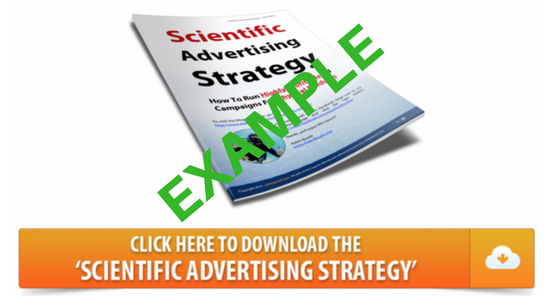 “On February 15th, Jacqui will publish a checklist post using text about Facebook Ads”. And just like that, you’ve built the framework for an outsourced article. Next, you need to put that information into a spreadsheet such as an editorial calendar to keep track of everything. The 6th column, ‘Offer’, can be a paid offer, or simply an email optin request (we almost always just ask for an email optin on AidanBooth.com, but on other niche websites we almost exclusively ask for people to buy something). For ‘Offer Delivery’, we set up ‘lead magnets’ inside Leadpages, and then automatically deliver whilst adding the subscriber to email list (learn how to do that here: http://www.aidanbooth.com/lead-magnets/). So you have one piece of content but it can be used on 4 or 5 different platforms. This is really simple to do when you’ve got the right systems and the right team in place. If you’re already going to the effort of creating the content anyway, then why not get it out there because it’s going to get some traction. Syndication takes time and energy, there are a lot of moving parts, so it’s critically important that you have a solid implementation plan, otherwise you’ll struggle to get it done properly. These numbers might seem daunting, but it’s TOTALLY doable, and very outsourcable as well. As you can see, at the time of writing, they have a fan-base of 79,000 people. NOTE: These things are very easy to set up, and once set, you can start syndicating your content. 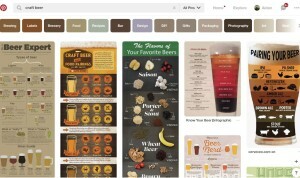 Check out Pinterest in the beer niche… you might wonder what you could put on an infographic about beer, well there are tons of things! If you’re wondering how you’ll create your infographic, here’s my advice… don’t over-think it. Just say to your designer, ‘here are the 5 different infographics that I love, can you design something similar’. It’s as simple as that you can just give them 10 bullet points and your job’s done! 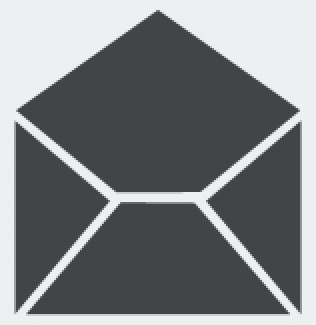 It’s all good and well creating the content, but let’s not lose sight of the main objective here, which is almost ALWAYS to capture an email address. TIP: You can’t really have ‘too many’ optin boxes, and it’s better to have too many than not enough! Lead magnets are offers that you give to visitors in exchange for their email address: ‘enter your email address to get ______’ (in this blog post we’re using our ‘Social Media Secrets’ presentation as a lead magnet). If you’re a frequent visitor of this website, you’ll know we use them all the time. 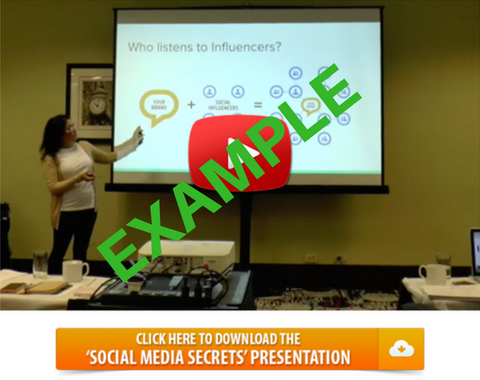 This example was on a blog post, with the call to action ‘click here to download the social media secrets presentation’, where we gave away a 30 minute video. If you ever do this make sure the video looks like it’s clickable and when they click on it, it pops up with an opt-in form, this works really well. This was an image embedded in a blog post about selling on Amazon. This is great if you’ve got something that you’re going to be releasing soon such as a new physical product, or some new information for example. This is what we did on a blog post prior to releasing our 100K Factory Revolution program. We’ve done this many times, try to make it attractive so people are going to want to download your offer. One tip, when creating an optin form, only ask the information you need, any extra information you ask for is going to decrease the opt-in rate (which is why in many cases we don’t even ask for a name, we JUST go with the email address). You can put this at the end of every single blog post that you do, and on any blog in any niche. If you are going to put this on every blog post, you want a generic giveaway offer that’s going to have broad appeal. This is a ribbon that appears at the top of the page, or sometimes at the bottom. It’s extremely effective and non invasive, you literally set it up once and it’s done! 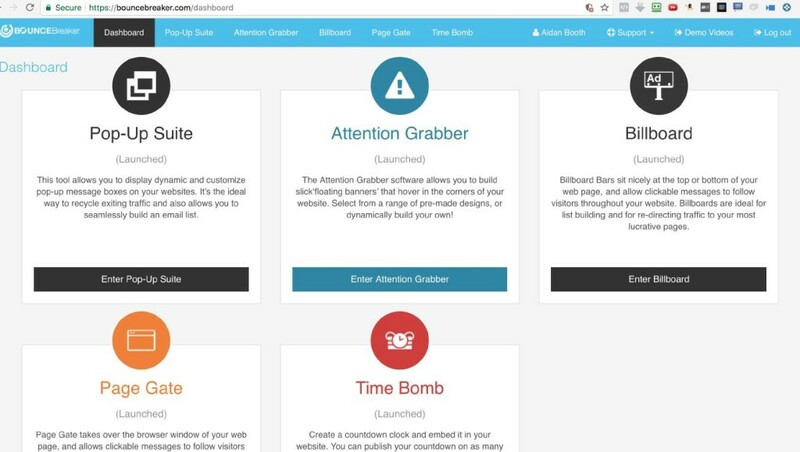 If you are an Online Marketing Classroom (OMC) member, you can use BounceBreaker. 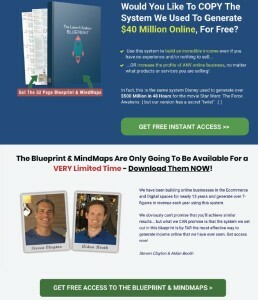 A squeeze page is designed to squeeze people into your funnel, so you want to be hitting them hard with a great offer. Make it crystal clear what you’re giving them and make sure they know they have to click the button and put their email address in. Make sure there are no other distractions on your squeeze page, don’t put any other buttons or navigation. 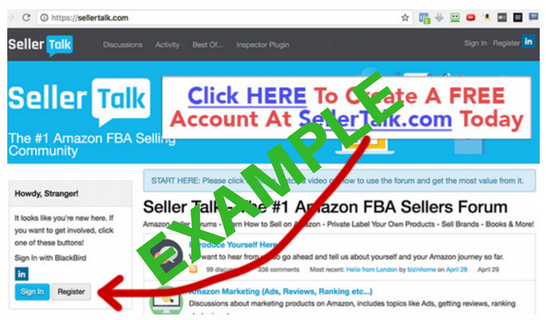 The example below works really well but it could be improved, we could add arrows or social proof for example. A lot of people don’t use thank you pages, but they’re a GREAT opportunity to either ask for a micro-commitment of some kind, or set up a new sale (and at minimum, deliver what you promised). 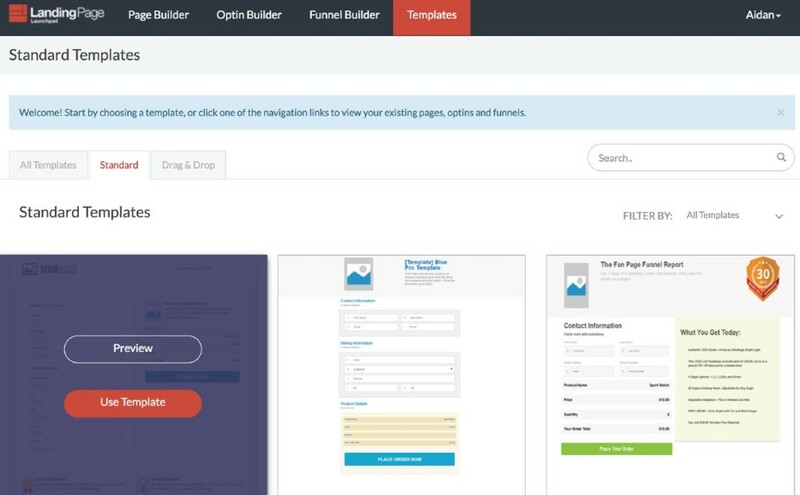 Just like with Bounce Breaker, if you’re an Online Marketing Classroom (OMC) member, you can use Landing Page Launchpad to make pages, optins and funnels (it’s a replacement for Leadpages and ClickFunnels)! *These costs could vary WILDLY depending on who is creating your content, handling the syndication, etc. Let’s look at your potential earning; total subscribers in one year = 20,670. In year two → MUCH more… upwards of several hundred thousand dollars. The exact number you stand to earn isn’t important here, because it’s impossible to predict with great accuracy anyway. 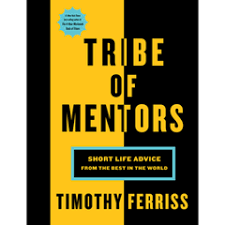 The point is that by applying a simple growth formula and a multiplier (to your subscriber value), you can begin to see what’s possible. Learn from what you’re doing and change course if necessary. 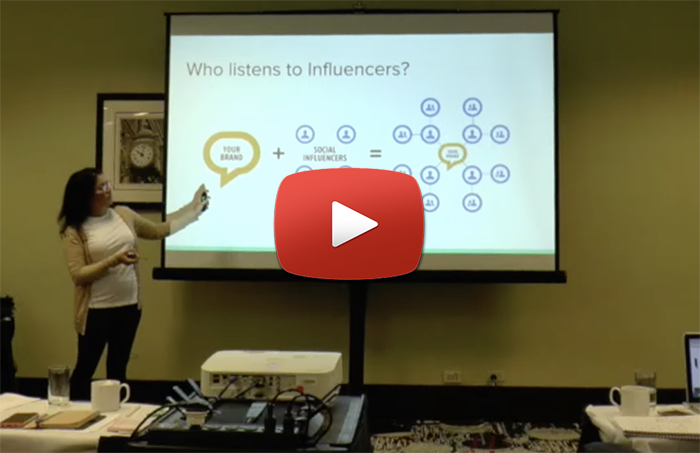 If for example you find that you’re getting amazing traction in your niche using your YouTube channel, you might decide to continue with your YouTube channel but not do Pinterest. 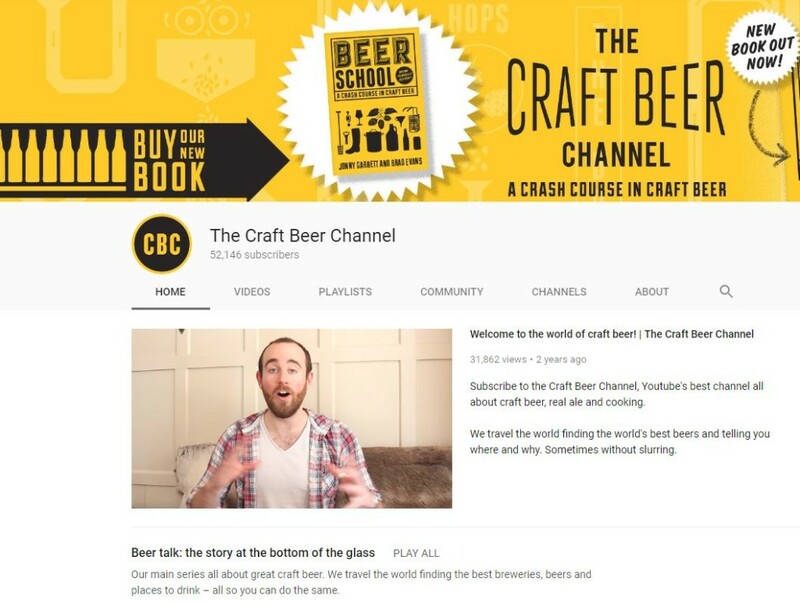 So use the content channel that gives you the most bang for your buck. 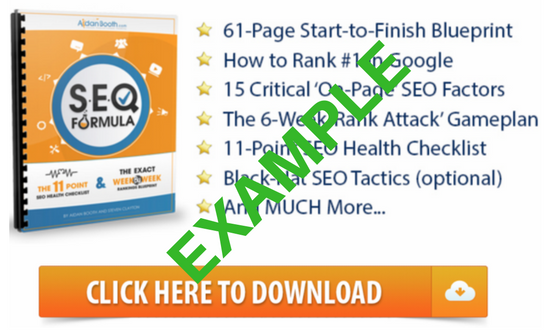 If you can get good targeted traffic, you’ll ALWAYS make money one way or another. 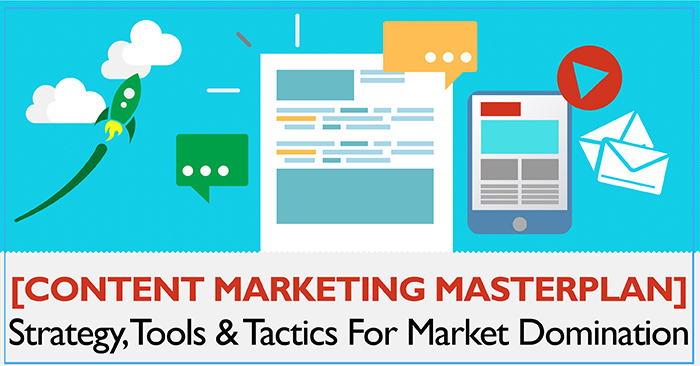 A thorough content marketing plan takes a lot of organization. You can absolutely do it by yourself, but it’d be a big job. As mentioned above, one person could DEFINITELY do this all to begin with, but outsource different components as you grow as it will definitely turn into a full time job. Very useful Aidan, there’s clearly a ton of good info here, I’m just unsure how to use it with what I’m working on now. How and where does it fit in with 7-Figure Cycle? THANKS! Hi Jessica, we’re about to get into phase 2 of the 7 Figure Cycle program where we’ll diversify traffic sources and talk about building a valuable database of leads, we’ll be covering how to use this there. Very timely for me, I will be implementing. A nice reminder for me of what I should be doing on a regular basis. Keeping consistent is my problem! a bit overwhelming at the moment – since I do not really see where it will fit into the picture of what we are learning at the moment – hope it becomes clearer when we get to it. Hi Charlotte, I assume you’re referring to the 7 Figure Cycle program.. if so, check my reply to Jessica. It will all become clearer soon. Great post packed with awesome ideas! One question, does your 7 Figure Cycle team handle any of the outsourcing for the logistics of database-building strategy? I can easily generate the blog, video and infographic content each week but maintaining a content site, creating autoresponder campaigns, generating lead magnets, list management…etc. is beyond my skill set. Does your team offer that or will you provider vendor lists perhaps? Hi Tor, our team don’t specifically offer that, no… however none of it is overly difficult, and there’s an abundance of talented cheap labor ($5/hr) who could do this kind of thing for you very very easily. I’d encourage you to try a small outsourcing project, and see how it goes.. I think that’s the solution you’re looking for. Thank you for this compact compendium of every & all possibilities! All in one place. This is terrific. I would like you to suggest some small outsourcing websites to me. 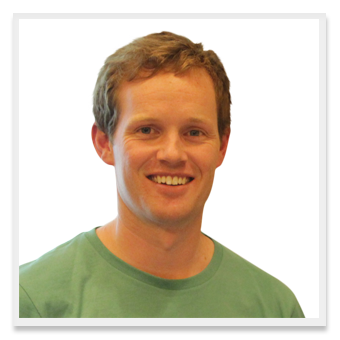 Hi Aidan, Really nice article about the meta strategies, which make all online business models work. I am in process to set up 7FC with LLC. Hopefully, the Wyoming LLC service you recommended, will finish their job within the next two weeks. Seems they are massively overloaded. Taking really long time and customer service is not good. Hope it will get better! But, your service is top notch! Hoping, you guys will make a webinar just about outsourcing supplier research, as asked several weeks ago. Hi Sang, we will be providing training about outsourcing suppliers outreach very soon! Sorry to hear about the delays with the Wyoming company! 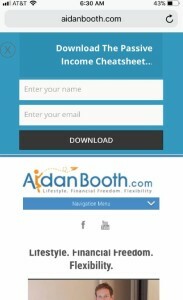 Hi Aidan, thank you so much for this great resource. This is a relevant info for anyone interested in making passive income online and since I’m stepping into the online space, I glad I found it. I will bookmark your blog and come back. Best Regards. Very good article. But it seems like a dumb question , but can you comment on finding information first before we start publishing it? I suppose we just do our own mega research everywhere but some concerns might be how and where to look, what is good or bad, or use or not use, what good or bad topics, what is too broad or what is too narrow, etc. I have think about it some more too but thought you could highlight something or point me in a certain direction. Maybe you or others have some published content about this? It’s just a case of doing the due diligence.. doing the research.. and remember, you don’t need to do it all yourself, but you’re right, you do need to be able to know if it’s good (and accurate) info or not. No real hack to doing this I’m afraid.